"Redbooth is web-based task and project management software." 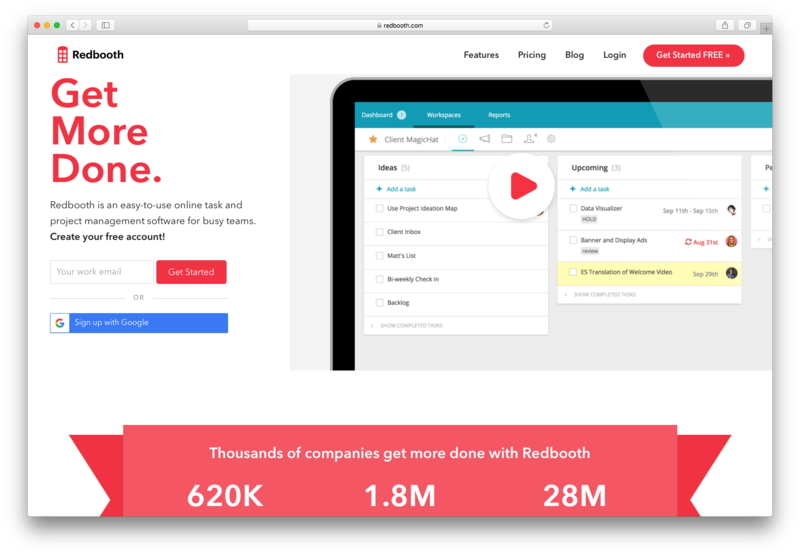 Redbooth is designed to help busy teams in project and task management. With this effective tool, they will get more work done and will increase the staff productivity. The service includes free and paid versions, along with mobile apps for Android and iOS. The core functionality of the tool is intuitive project management, task delegation, time-tracking, as well as integration with many frequently used business applications. Redbooth is manageable and flexible to use, allowing project teams and businesses get a clear picture of how their project is advancing. It also features collaboration possibility, file sharing, time tracking, and Gantt charts. Redbooth scored 90/100 in the Task Management category. This is based on user satisfaction (89/100), press buzz (52/100), recent user trends (rising), and other relevant information on Redbooth gathered from around the web. Redbooth is a workplace management and collaboration program that aims to help users and teams centralize and coordinate their efforts on multiple projects and tasks. 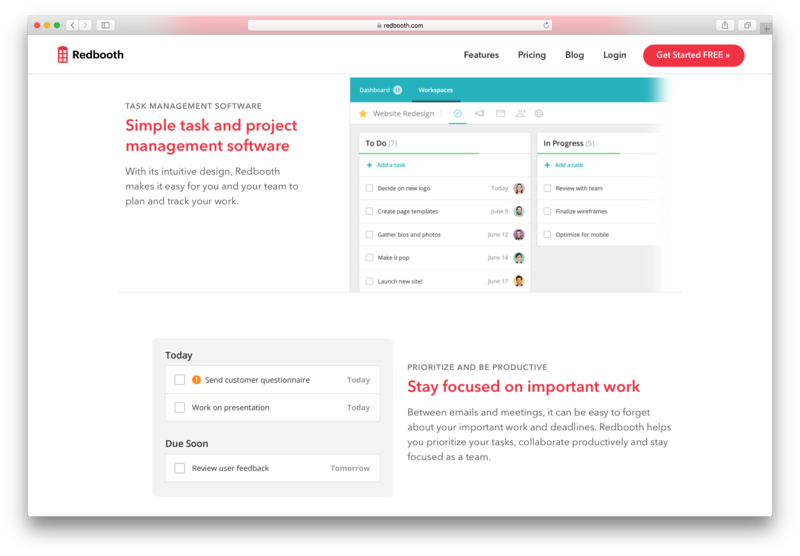 As it provides both project management and role segregation, Redbooth is an ideal program for helping multiple teams, companies, and enterprises finish complex projects and be ready to tackle the next one.Redbooth is a workplace management and collaboration program that aims to help users and teams centralize and coordinate their efforts on multiple projects and tasks. As it provides both project management and role segregation, Redbooth is an ideal program for helping multiple teams, companies, and enterprises finish complex projects and be ready to tackle the next one. Redbooth is designed to act and feel like a social media service – it comes with the kind of conversation system and file sharing capabilities users would see on the major social media platforms. With timelines for projects and the ability to convert conversations or messages into tasks and roles, Redbooth works as an instant online workplace environment. The in-built employee position tracker and task management system helps to maintain employee efficiency in accomplishing tasks and assignments. What are the features of Redbooth? Redbooth has a conversation system – like that of Facebook or Twitter’s messaging systems – that can be used to efficiently connect colleagues with each other. What makes Redbooth unique is that this conversation system is the basis for teams’ task timeline & project management. Messages can be turned into tasks and projects and can be used to inform users of their roles, comment on and discuss uploaded files, and assign important task details, such as assigned tasks, deadlines and specifying goals or objectives. Another function inspired by social media is the status update feature. This is similar to the status posts found on social media sites but has the added capability of converting the updates into tasks. It also comes with commenting systems that can be used to update the tasks or change them according to the comments submitted. These two systems work with the tasking system that lets users set goals and deadlines within the ongoing conversations or discussions. Redbooth makes sure users can easily and seamlessly start creating projects or tasks within conversations, in order to make sure new ideas are not forgotten or lost. Redbooth also provides role-based permission access to ensure users keep to their specific tasks and capacities without overstepping their boundaries or getting lost in the shuffle. In cases that users need to hold meetings and coordinate & present information in real time to their coworkers, Redbooth comes with a video conferencing function. Not only can this be used for meetings or presentations, it can also support company-wide announcements by giving users the ability to accommodate as many as 100 guests at once. This high-user video conferencing option ensures Redbooth can hold large-scale meetings easily, with a higher limit than most high-end video call programs. Redbooth also comes with file sharing integrations. Users can upload files to storage systems such as Google Drive or Dropbox with the changes triggering updates within in the Redbooth system. This enables employees to access company files remotely and without delay. The Textnotes feature serves as a supplement to the standard Redbooth ecosystem. You can effectively call it a wiki for the current company. It provides a centralized company information database, serving to instruct and enrich users. This includes adding footnotes that link to previous tasks or notes that can be used as the basis for the creation of some of the Textnotes pages. This makes it easier to access previously mentioned tasks or notes to ensure smooth progress. Users are able to sign into and use Redbooth through their mobile phones, tablets or e-mail accounts. the system automatically syncs across devices, so that all users are up to date with the latest file and notification updates in any projects and tasks they may be working on. Beyond this, Redbooth has a wide range of integrations, allowing it to coordinate with different ERP or CRM systems to ensure accuracy between Redbooth and any third-party systems you may be using. What are the benefits of Redbooth? Redbooth is groundbreaking in its implementation of the social media-esque system into task management programming. It works smoothly, with the ability to change messages, conversations and statuses into tasks and projects. This also ensures first time users will be able to easily get to grips with the system. With additional functions such as the wide-scale video chat, textnotes, and integration options; Redbooth is ideal for those who are familiar with social media systems and accounts. It also works well for companies who wish to use a simple and easy to manage project management system. Workspace availability – In the free version, users have access to two workspaces within Redbooth. 2GB of file storage space – A reasonable amount of data can be saved with this version. 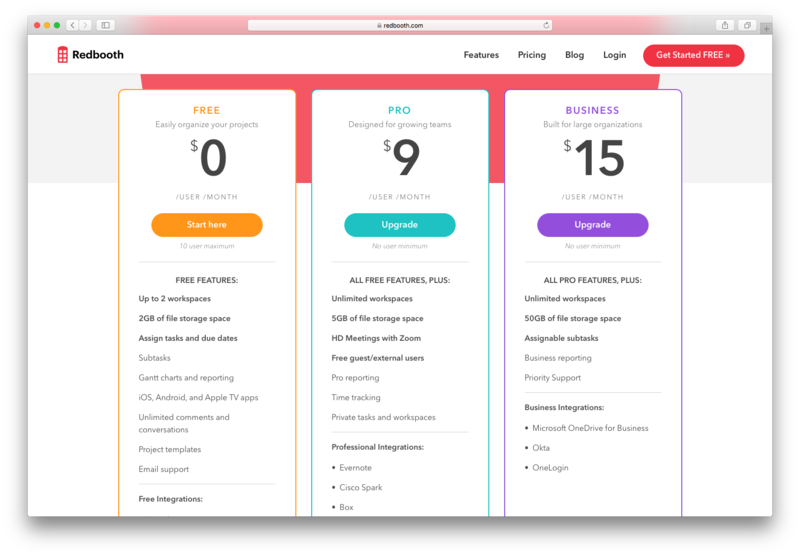 Although it is a small file storage space, it further emphasizes why Redbooth’s free version works best for smaller businesses. Assign tasks and due dates – This can be done by using the conversation and status updates. It works best to ensure a smooth and easy transition from personal time to work time without causing any complications to either. Subtasks – As additional usability for the tasks and due dates; the subtasks option lets users break down tasks into the step by step process required for its completion. Gantt charts and reporting – With these charts, users can monitor their progress in accomplishing their specific tasks or assignments without losing sight of the end goal. It looks like a loading taskbar, and can be a great visual aid to keep users and team members on track. iOS, Android and Apple TV access – Redbooth has mobile applications for both iOS and Android—and even for Apple TV. These can be used by users free of charge. Unlimited comments and conversations – Though there is a limit to the storage system, the comments and conversations system is unlimited. Project templates – If the user has several projects running concurrently, Redbooth can help by giving users access to a pre-existing project template. This can save them time by providing a pre-existing project workflow for their needs. Third-party storage integration – Redbooth can connect to external files in Google Drive, Slack or Dropbox. This means users can store files and connect them to Redbooth without having to worry about storage. Unlimited workspaces – This lets companies create as many workspaces for as many accounts as they need for their teams, departments, and clients. 5GB of file storage space – Double the storage space, double the files and documents vital to the company. HD Meetings with Zoom – Useful for companies and users who need to hold meetings and presentations for their objectives and tasks. It supports up to 100 users in the event of company-wide announcements or discussions. Since this lets users use Zoom’s high-quality video conferencing servers, it can assure the best possible audio and video quality. Free guest/external users – In case you need to communicate with your clients or outside contractors, Redbooth comes with a free guest user function so occasional or one-time logins can be facilitated. Time tracking – This feature makes it easy to track the amount of time dedicated to certain projects or tasks, and identify any possible bottlenecks taking up more time than should be expected. Professional integration – Users can use this system in coordination with enterprise-level note and file sharing programs such as Evernote and Box. 50GB of file storage space – This is best option for large companies with multiple documents and projects in need of archiving. Assignable subtasks – These subtasks can now be designated to specific personnel so users can optimize their workforce by assigning tasks to the best available members. Business integration – Finally, this integration system includes all previous programs, as well as adding in applications such as Microsoft OneDrive for Business, and OneLogin. Despite its relatively small storage space and simpler integration system, Redbooth is ideal as a workspace messaging and task management program. With a social-media style UX, and tasks being traced and converted into timelines and messages, users will find this program easy to learn and to use. Who are the main user groups of Redbooth? Main users of Redbooth are project teams in SMEs and large enterprises. Does Redbooth offer multi-user capability (e.g. teams)? Does Redbooth integrate with any other apps? It integrates with Dropbox, Google Drive, Box, SignNow, Evernote, GitHub, Paydirt, Just Add Content, Pivotal Tracker, Gmail, Microsoft Outlook, Zapier. What platforms does Redbooth support? Redbooth is a web-based platform with Android and iOS apps. What is Redbooth generally used for? This is project and task management tool. Does Redbooth offer guides, tutorials and or customer support? Support options: FAQs, Forum, Knowledge Base, Online Support, Video Tutorials. Does Redbooth offer an API?